Th​is guitar is designed with a tapered headstock. This feature ensures stable and precise tunings, which is ideal for open tunings. If you have ever experienced difficulty tuning a guitar before, you will definitely appreciate this design. In addition to this, on the instrument is tuned, it will remain in tune for slightly longer than some of the competitive brands. The compensated saddle is to ensure better intonation or accuracy of pitch. Without this feature, a guitar would deliver poor intonation, rendering it useless. Combining the compensated saddle and TUSQ nut will ensure the best intonation possible for an acoustic guitar. American consumers tend to believe in their home-based products. In fact, many American consumers refuse to invest in foreign-made products. 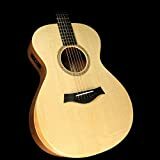 Well, if you just happen to be one of these consumers, you will definitely appreciate the fact that the Seagull S6 Acoustic Guitar is designed and produced in an American-based facility. So, you are guaranteed to receive a high-quality instrument that delivers beautiful sounds. ​It is smaller than some of the competitor brands, such as the Fender Dreadnought. If you struggle to play larger acoustic guitars, this may just be the guitar for you. In fact, you should not experience any discomfort when playing th​is one.